Each year Ms. Schlumbohm's class builds on the work of the year before, seamlessly integrating new students with old (see ﻿Ms. Schlumbohm's Class Project﻿): This year's project took first in their school's Science Fair. Rather than continue on to the Interior Alaska Science Fair competition, the class decided to write a science journal article. Here it is: We at OneTree couldn't be prouder of them. They carefully describe their methods and analyze their science project results, and refer the reader to other scientists' published peer-reviewed articles. Please enjoy reading the fruits of Ms. Schlumbohm's community of learners' experiment and explorations. 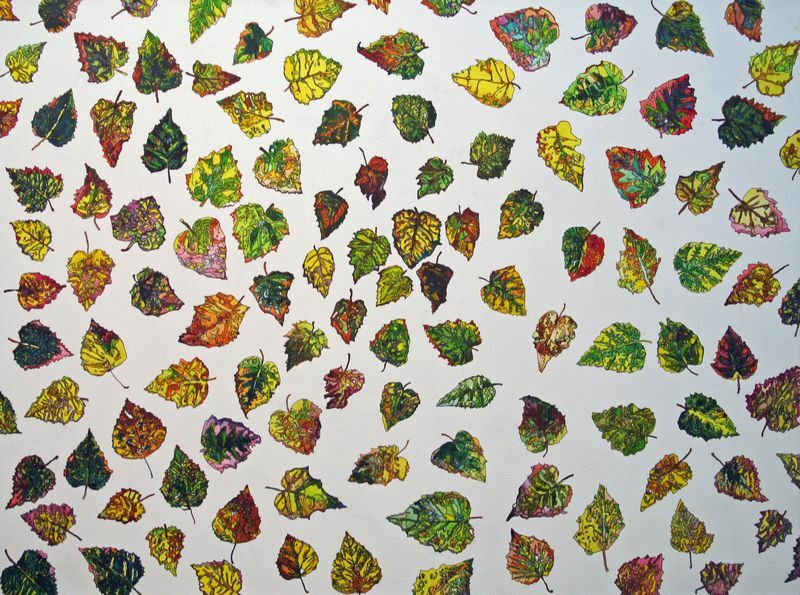 Our friend and STEAM Studio Artist-in-Residence, Kes Woodward, is one of Alaska's best known contemporary artists. He recently updated his website to include mention of his collaboration with us together with his latest work. It is a joy to work with Kes and we are glad he feels the same! Please follow the link to see his website and the beautiful painting inspired by the Tilly! Rosary ©Kesler Woodward 2016 Acrylic on Canvas 36" x 48"
OneTree Featured in the News...Twice! Thanks to the intrepid Daily News Miner reporter, Kris Kapps, OneTree Alaska has been featured in the local news, not once, but twice! 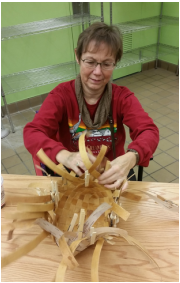 Kris interviewed Jan and Nicole first about the project's origins and direction, and then about a wreath-making workshop hosted during the holidays, Please check out these wonderful articles, linked below. An Ex-STrEAM-ly Successful First Event! Slowly, but also all too quickly, the days crept by to Saturday, October 17: the date of OneTree's much-anticipated first event in its new maker space--the old Lola Tilly Commons kitchen on the University of Alaska Fairbanks (UAF) campus. Over the past few months, UAF Facilities Services did the technical work to morph the kitchen into the OneTree Alaska STEM to STEAM Lab. Program staff aided the effort with flurries of cleaning and organizing; it was exciting and stressful in turns. On Saturday, not even the rain could dampen our spirits as we welcomed our core K-12 teachers, colleagues and volunteers to the Tilly. 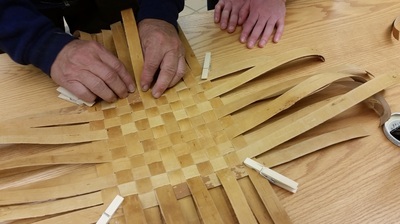 Workshop instructor John Zasada shows Birch Pavelsky how to begin weaving up the sides to form the basket shape. John helps Erin Harvey move on to the next step on her basket. There could have been no better person to lead the STEM to STEAM Lab's first workshop than Dr. John Zasada, one of the inspirations behind the creation of OneTree Alaska. John is well known to many in the Fairbanks community from his seventeen years of work as a research silviculturalist at the Institute of Northern Forestry. Towards the end of his career, John became interested in the utilization and beauty of birch bark. 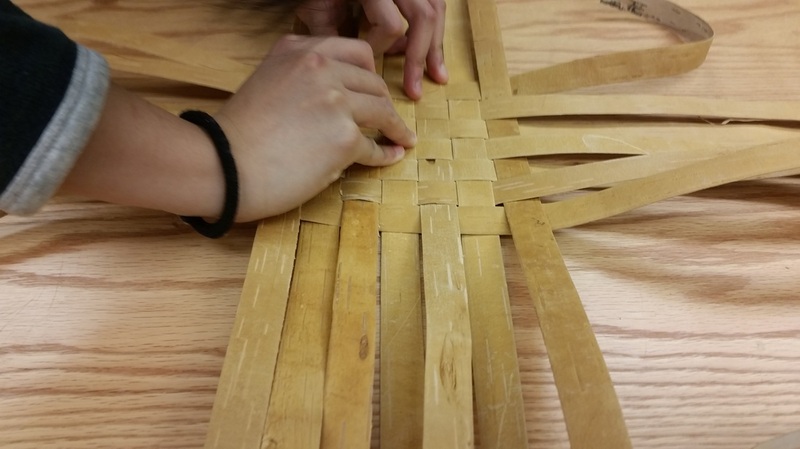 Journeying from his home in Minnesota, John brought his knowledge of birch bark weaving and much more to the group. 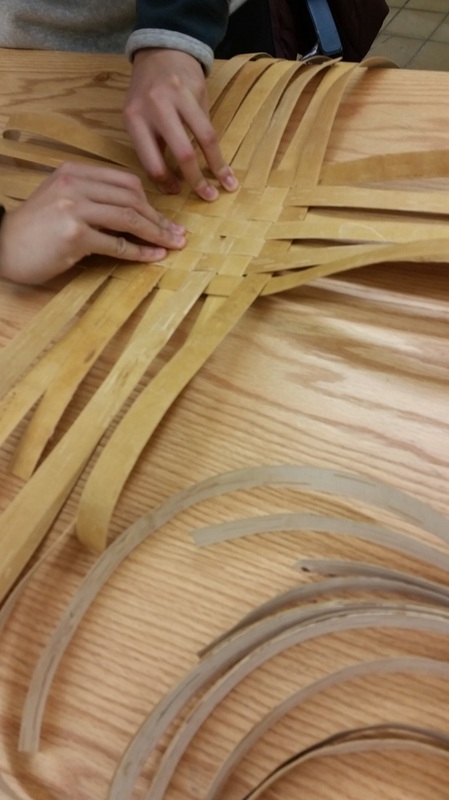 We learned to make a bread basket that can be used to bake and serve bread in. Just a few hours after the workshop, Randy Smith Middle School teacher Chis Pastro emailed, "Please tell John Z. that I finished the basket and it is beautiful (even with its perfect imperfections)." 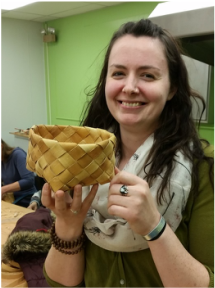 Natasha Pomeroy holds aloft her beautiful completed basket! 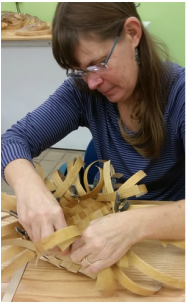 Marlene McDermott works meticulously on her basket. Chris Pastro weaves the first layer of her basket, and is about to move onto the next step! Welcome to our renovated website! We hope you enjoy the new look. Some pages are still under construction, so please excuse the lack of content in some sections. Please let us know if navigation isn't clear or you have suggestions to improve the site.